Boy, if there ever was a seductive siren it is the Fear of Missing Out (FoMO.) It has been around since earliest times. FoMO has had many iterations over the centuries. The poorer hunters got the lesser cuts of the catch; and the lesser choice in women. Later, in the 1950s, it became “keeping up with the Jones’s.” Now it has become 1500 friends (you’ve never met – yet feel you must answer every text, post, instagram, etc., and always be (for God’s sake) at least equal. BRUCE JENNER, MY HAT’S OFF TO YOU! Bruce Jenner, my hat is most definitely off to you. Last night while my friend was winning an Emmy (congrats David Doyle – you deserve it not only as a producer but as a human being – proud of you! ), I was watching the Bruce Jenner interview. It was a very interesting story. 16 hours later I find I feel for him on two counts. The first is compassion for his suffering the weight of a life lead dealing with the issues that are part and parcel of realizing that you are living with being born in the wrong sexed body. Second, I was concerned for him having to “come out” in Macy’s window. Self CPR can save your life! I don’t kno who wrote this- it was not me. But it is a must to know! 1. Let’s say it’s 7.25 pm and you’re going home (alone of course) after an unusually hard day. 3. Suddenly you start experiencing severe pain in your chest that starts to drag out into your arm and up in to your jaw. You are only about five miles from the hospital nearest your home. I have waited for a bit before publishing a blog entry on Germanwings. It was my feeling that between my Vimeo video (see the Vimeo link in the media and consulting tab on this website) and my How to Survive a Secondhand Disaster (in this blog section); I felt I had pretty much covered it. Moreover it was my sense that the co-pilot must have been psychotic. I will follow up on that point in a moment. Truth in advertising here: The author is a friend. All that out of the way, this is one fabulous read! 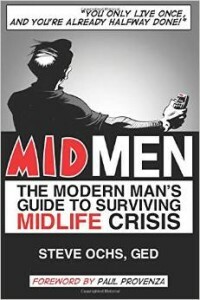 MIDMEN: The Modern Man’s Guide to Surviving Midlife Crisis (a la MadMen), is a must read. Besides being chock full of all sorts of interesting facts about middle age the book serves as both a handbook for surviving middle age as a man, and as an owner’s manual if you happen to be in possession of one of those surly, unruly creatures making their way through midlife: a foot soldier in the army of Midmen. WHAT DO JUSTIN BIEBER, CONRAD HILTON, AND ROBERT DURST HAVE IN COMMON? So what do Justin Bieber, Conrad Hilton and Robert Durst have in common? Recent events made me wonder about that. A friend of mine asked me if I was going to write a blog about Justin Bieber trying to remake his public image by putting himself at the center of a celebrity roast that was filmed this past weekend at the Sony lot. Early reports seem to indicate that no one was fooled. In fact at least one roaster reportedly told Bieber he didn’t like him at all and hope this attempt to rehabilitate his image failed. It’s a sad commentary as well as a testament to his history that even one of the most entitled groups in the world: celebrities, found Bieber‘s antics deplorable. IT’S JANUARY 8TH – DO YOU KNOW WHERE YOUR RESOLUTIONS ARE? It seems like only yesterday; it was New Year’s Eve. Yet, for many, it seems years ago when we try to remember our resolutions (fervently made, though they may have been.) Packing the list of resolutions in our mind’s back pocket is much like buying a lottery ticket, stuffing it in your desk drawer and never checking it. It is highly unlikely your resolutions will become manifest if you don’t think about them. Never looking at them again leads to never thinking about them. And an unchecked winning ticket in your desk drawer is worthless. 8% of people actually achieve their resolutions! 8%! Why only 8%? Wolfgang Lederer died on January 3, 2015; just short of 96 years old. The passing of a great good man may go largely unremarked upon if he is not famous. However, never is it without a large sigh from quarters touched by the man. Though one cannot feel he was robbed with near 96 years, on can feel the loss of a great spirit – a humble spirit and wise. QUESTION: WILL I EVER BE ABLE TO BECOME A RECREATIONAL USER? © 2014 Dr. Ralph Diner, Ph.D. MSCP. All Rights Reserved.